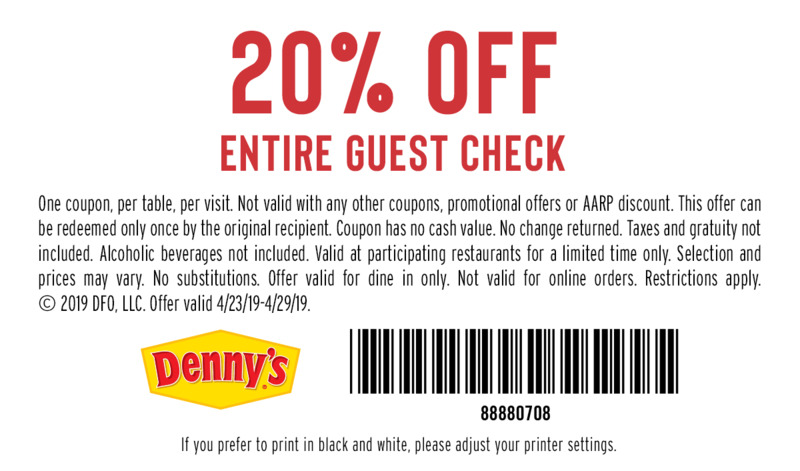 Get 20% off your check with this Denny’s coupon good today through Monday, April 29, 2019. CLICK HERE for your Denny’s 20% off coupon. Print and give to your server to get 20% off your check. Good for dining in only. Good April 23-29, 2019. The chain announced the coupon in an email to subscribers. Not good with other coupons or Denny’s AARP Discount. 20% off entire guest check. One coupon per table, per visit. Not valid with other coupons, promotional offers or AARP discount. Can be redeemed only once by the original recipient. Alcoholic beverages not included. Valid at participating restaurants only. Dine in only. Not valid for online orders. Restrictions apply. Valid 4/23/19 -4/29/19. Get 3 sausage links, 3 bacon strips, 2 eggs and two buttermilk pancakes for $5.99. Good for a limited time at select locations. Curb your carnivorous cravings and head to Denny’s for the NEW Meat Lovers Slam! Join us today and get two eggs, three sausage links, three strips of bacon and two pancakes, starting at just $5.99. The Meat Lovers Slam is available all day, every day starting April 2, 2019. Denny’s announced the new special on the Denny’s Home Page and on Facebook. Fluffy, filling and fresh from Denny’s, it’s our NEW omelette lineup! Head over to try one of our four NEW omelettes, starting at just $6.99. Get 15% off your check when you show your AARP card at Denny’s. Discount is good for your entire check (some restrictions apply). AARP discount is not good with other coupons or offers. To receive your 15% discount, just show your valid AARP membership card any day of the week. Denny’s and AARP announced the deal on the AARP Discount site. Find other restaurant discounts in our story, AARP Dining Discounts. Denny’s (also seen as Denny’s Diner on some of the locations’ signage) is a full-service coffee shop/family restaurant chain. It operates over 1,600 restaurants in the United States (including Puerto Rico), Canada, Curaçao, Costa Rica, Honduras, Japan, Mexico, New Zealand, Qatar, and the United Arab Emirates. Denny’s is known for always being open and for serving breakfast, lunch, dinner, and dessert around the clock. Unlike many other restaurant chains, Denny’s does not close on holidays or nights, except where required by law. Many of their restaurants are located in proximity to freeway exits, bars and in service areas. Denny’s started franchising in 1963, and most Denny’s restaurants are now franchisee-owned.